"knit even until armhole from first shaping measures 4 inches ending in a pearl row". Without seeing the pattern it is difficult to be 100% sure what it means but I can make an educated guess. 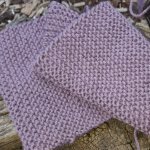 I would assume that the instructions means for you to continue knitting in whatever stitch pattern is used for you item until you have the length specified between the first armhole shaping and the needle. Unless otherwise indicated in the pattern, it is my bet that you are knitting all the stitches you have remaining without any further decreases.